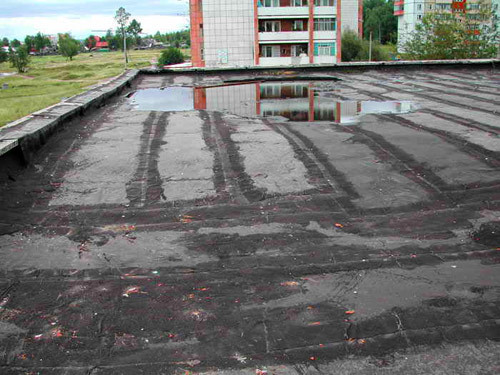 Soft roofing material, which cover roofs of apartment buildings, expanded polyethylene even longer, according to Sergei Nesterov. Ryazan is unique in that in this city as much as 4 plant roof — "Tehnopleks", "Shinglas", "Ryazan Cardboard Roofing Plant" and "Orgkrovlya." After such roofing materials attributed to hazard class 4 ("low risk"), their disposal has become more expensive. "Then for the disposal of 60 tonnes we paid about 80 thousand rubles," — says Nesterov. For businesses, this also meant an increase in the costs of disposal. The idea of processing recyclables at the time seemed a good way — then not only would not have to pay themselves, but also could sell the resulting secondary product. Nesterov started looking for suitable equipment. Has chosen and purchased from middlemen mini-mill PBM — the development of Kaliningrad "Inekovir." Investment in equipment and production facilities totaling 7.5 million rubles. Mini-mill can process the bitumen roofing and asphalt mastic, which is used in construction, in particular, for waterproofing basements, swimming pools, etc. Recyclable materials for recycling — a roof, which is removed from the roof during repair work (in the summer), and a marriage that give Nesterov 4 Ryazan roofing works (in winter). High efficiency — approximately 50% — is achieved, including the expense and the fact that recycle goes free. Plants are interested in having someone to reworking their marriage, otherwise you’ll have to pay for disposal. On the production line rolls roof first crushed and then subjected to heat treatment, and the output is the final product. Bitumen and bituminous mixture, obtained in this way, bought mainly mortar stores and wholesalers. The bulk of buyers — in Krasnodar and Rostov. Seasonal demand — peaking in summer. The price of bitumen, which sells Nesterov, about 1.5 times less than that offered by major factories. "In the manufacture of polymer bitumen enriched to 16-20% — says Nesterov. — Recycled asphalt is no longer in need of enrichment, so its cost is approximately 1.5-2 times less. That is a cheaper bitumen that is obtained by refining crude oil. " By recycling 65-70% of recycled and converted into the bitumen mastic asphalt. Tails (something that is not recyclable) constitute 15-30%. According to the reference "Inekovira" cost of 1 ton of bitumen produced — from 950 to 1,500 rubles. The market price of a tonne of similar bitumen ranges from 7,000 to 12,000 rubles. Production volume — 130-150 tons of bitumen and bituminous mastics year. Annual turnover — 2,000,000 rubles. By the way, in the crisis and post-orders for the replacement of the roof almost vanished. Recycling has become a major business Nesterov. Initial investments have paid off in 2 years. The situation is, by the way, a little paradoxical — in fact, by product production Nesterov intersects Ryazan roofing factories that supply it free and raw materials, so obviously lose the competition on price. "In terms of them we have, of course, is not no competitors — explains Nesterov. — Yes, and the markets too. Most of their products they ship, as far as I know, in Eastern Europe. " But in a small market in private demand of recycled asphalt is quite competitive. Moreover, the demand exceeds the supply — this year, customers are wholesalers Nesterov request a 200 tons with total production of 150 tons. According to the calculations Nesterov, if it were possible to increase production to 260 tons, the demand for Ryazan would have been satisfied. "For this, you need to duplicate the production line and enter the second and third shifts, — says the figures Nesterov. — Then drop and marginal costs — workers will not have to heat up the oven, for example. " Nesterov estimates the additional investment of 2 million rubles. Then it was possible to expand the range and end-products — to produce more bitumen and bitumen emulsion primer. "The bitumen emulsion, polymer-rich, would be good for road construction — a dreamy Nesterov said. — Then on the road to 25-30 years to repair would not have to. " According to Nesterov, find a source of investment is difficult — investors are cool to the local recycling projects due to lack of global perspective. But still processing or recycling clearly become an important industry in the not-too-distant future. For example, on the Olympic Games "Sochi-2014" has already announced the implementation of the concept of «Zero Waste» (popular in the UK and Japan, the concept of "zero waste"). "The principle of" zero waste "means both the principle of" zero waste "- the recovery and reuse of used products, components and materials from which they are made," — said on its website. Prospects for the development of recycling, apparently quite large. On a special case — processing waste tires in soft cover for playgrounds "Expert Online» wrote. But you can not just recycle old tires and roofing materials. Be recycled plastics, polymers, cable waste, waste batteries, etc. The difficulty is that the processing is still considered a low-profit business, and should be supported by government subsidies. But the funding does not necessarily have to be the budget. For example, there is a practice so-called "collateral value" — when, for example, the cost of the beverage in the plastic bottle included processing cost bottle itself. This initiative is voiced, but the support is not received. Although Greenpeace is generally 2 years ago warned that after 8 years of Russian cities drown in their own garbage. 6 years remaining.